My nephew Indy thought long and hard about what he wanted for his birthday party this year and he certainly had a little inspiration from the movie National Treasure. His first request was a cake, not just any cake but a cake in the shape of a pyramid (like the one on the dollar bill). This pyramid also needed to have gold coins in the middle. That is one tall order but my mom and I took it in stride. Luckily we had a couple months to ponder the 3 dimensional request. Our solution: rice krispies. Due to their stability we were able to stack and carve them without adding frosting layers (I hate excessive frosting). 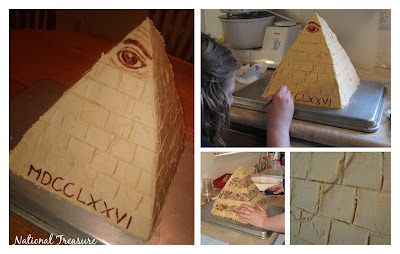 Using a long knife for straight lines and a little gelled food coloring as paint, I added a few finishing touches and voila... a pyramid. The second request was a treasure hunt, like the movie. My mother and I pondered and brainstormed. 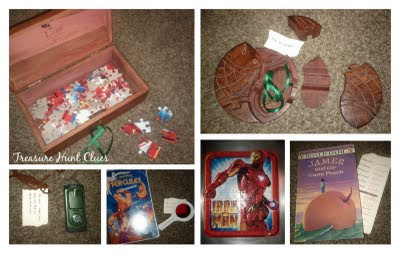 Pretty soon we had a list that included secret messages, compass directions, a book with ciphers, a puzzle with a message, clues hidden in jello, puzzle boxes, musical clues, glow in the dark clues, etc. While trying the make the clues age appropriate we overshot our goal and made them complex enough to make the hunt last 2 hours. Despite some squabbles over who was the leader, and one little girl who seemed to have all the answers, we finally found the treasure (bags and bags of candy) hidden in the dryer. The best part of the party was the excitement of a mob of children moving toward the next clue, knowing exactly their goal. The night was quite the success and I can't wait to organize such a birthday party for my own children one day. HOLY COW! That is so creative. You're amazing.